A two-transistor phono MC step-up offers lower noise than a one-transistor model. This MC step-up uses two PNP transistors and can be powered from a 12V battery (or other clean/regulated 12V power source). Charge the battery when the amplifier is not in use. The value of R4 depends on the hfe of the transistor used (Table 1). Distortion of the amplifier is low due to local feedback. The gain of the amplifier is 19-20dB. above: FIG. 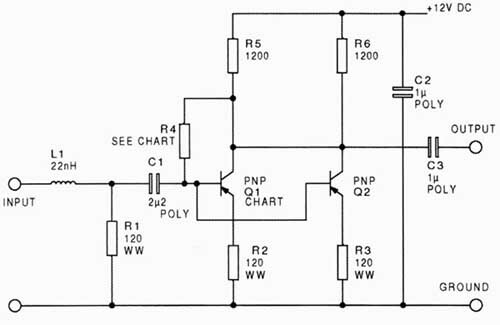 1: Two-transistor preamp circuit. above: FIG. 2: Pinouts for the different transistors. Bottom view.